Argentina wine Archives - Write for Wine: It's Wine O'Clock Somewhere!Write for Wine: It's Wine O'Clock Somewhere! 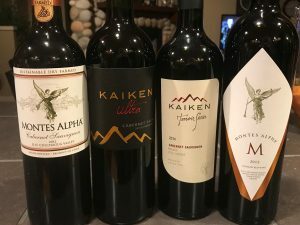 We recently tasted three different releases of Cabernet Sauvignon and a Bordeaux blend from Montes Wines and Kaiken Wines, which we discussed during a Twitter chat with founder and winemaker Aurelio Montes Sr. — considered to be a founding father of the modern Chilean wine industry. Prior to the Twitter event, we enjoyed three other Montes wines that were sent to us in time for Thanksgiving. See below for details.